What you just saw is the reason why Door Armor Max Combo kit comes with a $500 lifetime guarantee. What does that mean? If your door is kicked in with this kit properly installed, they’ll pay you five hundred dollars! In 14 years, ArmorConcepts has actually paid only two warranty claims, neither one because the product failed. 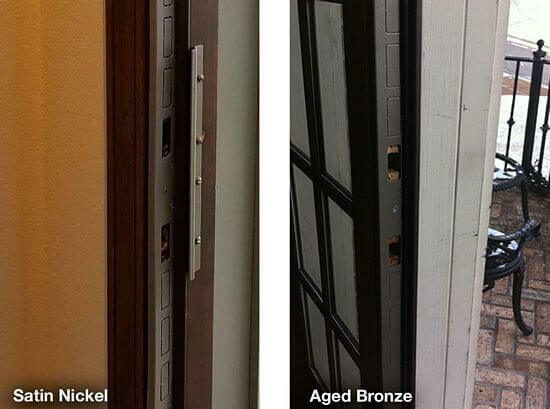 One was because the door snapped in half and they still honored the warranty and the other one was because the complete bottom of the door was busted off. So they stand by their products. They think like a lot of customers think. They don’t expect anyone to believe what they say, so they put their money where their mouth is. And they actually welcome anyone who wants to test it. Door Armor Max Combo is not only super strong, it is easy to install at the same time. Typical installation time is between 20 and 30 minutes. It’s really not that difficult. Essentially you’re using the security plate for reinforcing the door jamb itself. The Door Jamb Shield goes on the frame of the door. This is really the most important part because it stops the door from splitting the frame when it’s kicked. If you understand how a door works, you know that a dead bolt only goes about half an inch into the soft wood, stopping the door from opening. What this jamb shield does it lays up against the frame. As you can see there’s a bunch of different holes that you can knock out. 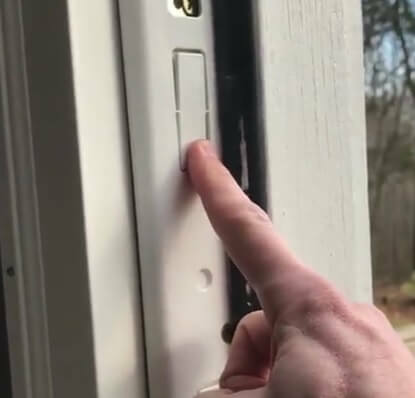 So if you have more than one deadbolt, if you have more than one lock, if you have a deadbolt that’s halfway up the door, you just slide it up and it’s very easy to install. Once you’ve reinforced the jamb part, there are two other parts that are as equally important. 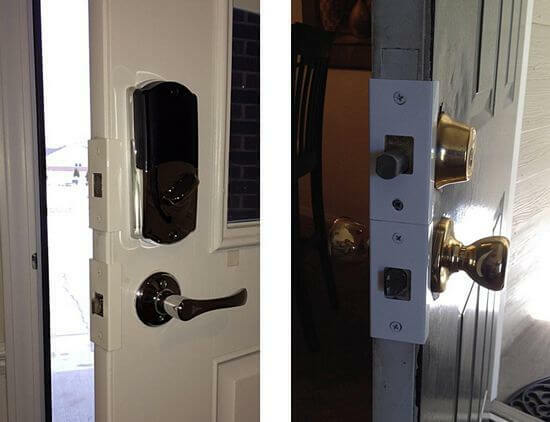 The door shields which go on the lock area of the door, over the dead bolt and the door knob. The kit comes with two of those. And then you have the the hinge shields. One of the pieces that people generally forget about are the hinges. What people found out the hard way is that if you reinforce the left side of the door and you don’t reinforce the hinges, then intruders just kick the door off of the hinges and they get in just as easily. You never have to take the door off the frame, you never have to really alter anything. This goes over the hinge. Two screws come out, two screws go back in and then you’re basically reinforcing the stress of a kick and that’s why the product works so well. You’re able to use a relatively thin gauge of steel, at 16 gauge steel. For 95% of doors you’re able to fit the kit in. The biggest advantage is that you’re reinforcing all the weak points in the door. People often wonder why the jamb piece does not go all the way up to the top of the door and the answer is it really wouldn’t matter. At the end of the day physics is physics – you’re distributing the force of the kick throughout the strike plate and making it longer will just make it more expensive. 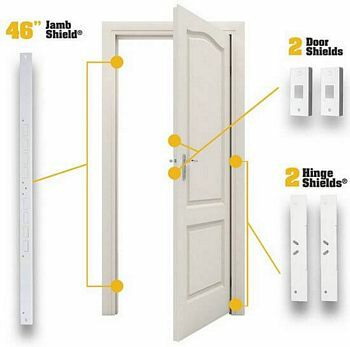 If you’re going to install this, test the space between your door and your door frame and if you can fit two quarters in there, you’ll have absolutely no problem installing this kit in about twenty to thirty minutes tops. If you don’t have that space, there are usually some things you can do to give yourself more space and if you still don’t have enough space you can use another product by ArmorConcepts. 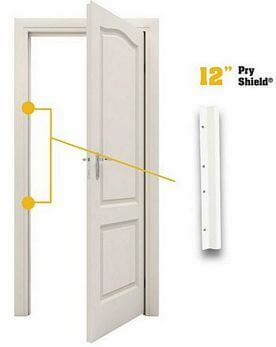 It is a thin piece of metal called Pry Shield that you install to the left of the deadbolt, which prevents prying. This piece actually serves two purposes. 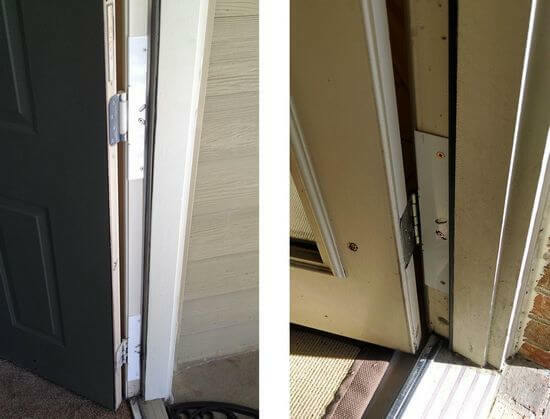 For the doors that don’t have any clearance, it prevents us from having the jamb shield installed on the frame of the door, which makes the door easy to close. This piece actually sandwiches the door so it does perform kind of a similar purpose and prevents the door from splitting. That’s what’s really important. If you just reinforce the jamb part of the door and you don’t reinforce the lock part of the door, the door is going to split right in half. So this piece sandwiches the door, prevents the door from splitting and it also prevents someone from being able to get a pry bar in. The kit comes with seventeen three and a half inch screws. They’re self tapping so you don’t have to pre-drill. They come with a square drive. This product is so cool and so effective. I’m a hard believer. I think it’s one of the things that is super practical for people to pick up on. If you can do small improvements like this around your home, it really pays dividends. Essentially you’re buying time and that’s what it’s all about. Can someone still get in your house? Yes. If someone has an hour they’re going to get in your house. They can climb through a window, they can climb through the chimney, they can cut a hole through the wall. 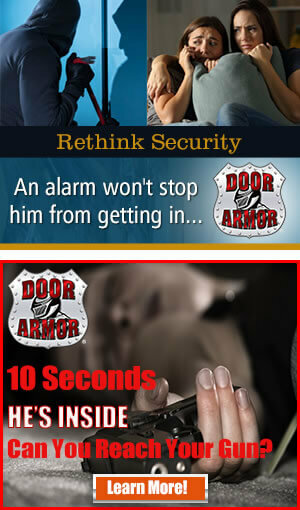 The average thief is in and out of a house in 3 to 5 minutes, that’s what they want to do. They’re not going to take 25 to 30 minutes trying to get into your house. So if your doors are secured to the point they can’t kick them in, they are just gonna go to your neighbor’s house, move on to a less harder target. Door Armor Max Combo Set costs $89 and that’s the whole kit. There is also the mini kit and it costs $69. It comes without the hinge protection. It actually comes with long screws to reinforce the hinges. It is a little bit less secure but still more secure than anything else. Click Here to Buy the Best Door Jamb Security Plate and Hinge, Lock Reinforcement + Free Shipping! Door Kick in Protection That Actually Works!